When I first contacted Fionn I mentioned being the last of a long line of generations of miners and that my grandfather Fletcher, my father and I had each been granted a "Mines and Quarries Board" Certificate of Competency. My next few paragraphs expand on this and include a very brief reference to the mining connections of two of my uncles. I believe Thomas Trueman Fletcher, my grandfather, was the holder of Second-Class Certificate No: 3836 dated 2 Sept 1899 a and granted under the Coal Mines Regulation Act 1887. (Certificate of Competency as an Under-Manager of Mines granted under the Coal Mines Regulation Act, 1887 (50 and 51 Vict. Cap. 58, Secs. 23 and 80) From a list published in 1911 covering the period 1st January 1896 to 31st December 1910) He was a Back Overman in 1911 and referred to himself as a Colliery Official in 1933. Thomas’s address in 1933 and when he died aged 66 on 24 March 1942 was 9 East View, Sherburn Hill, County Durham. This leads me to believe that he may have ended his career at Sherburn Hill Colliery c .
John Charles Hunter, my grandfather, was a Fore Overman at Mainsforth Colliery c.
a)	Dean and Chapter Colliery c in 1937.
b)	Leasingthorne Colliery c in 1940.
d)	Mainsforth Colliery c in 1943. He became a Colliery Manager sometime around 1943/4. Fionn has kindly included some details of my father's career as a Colliery Manager f.
My uncles, James D Fletcher and Leslie Hunter, were respectively a colliery electrician b and a Mainsforth Colliery foreman electrician. I was granted the Manager's Certificate No: 9782 dated 17 January 1967. However, as you will read in another of my notes I left the industry before I had the privilege of being appointed to be an Official. What follows is what I remember about the positions listed in my first paragraph. Bob Bradley's "A Comprehensive History of Mining in the Derbyshire, Nottinghamshire and Leicestershire Coalfields" may be of interest to anyone wishing to read about other colliery officials positions e.g. the Colliery Surveyor g, the Colliery Mechanical Engineer, the Colliery Electrical Engineer, the Safety Officer and the Ventilation Officer. 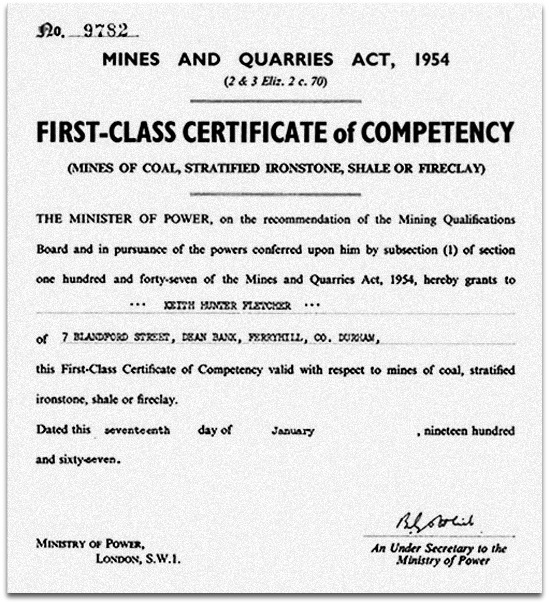 The owner or agent of every mine had to nominate in writing a certificated Manager 1to be responsible for the daily personal supervision, control, management, and direction of the mine. He also had to send written notice of the Manager's name and address to the Inspector of the District in which the mine was located. a)	More than 30 people h had to be at least 26 years old and hold a First-Class Certificate of Competency. b)	Less than 30 but not more than 14 people h had to be at least 23 years old and hold either a First-Class or a Second-Class Certificate of Competency. I. Ensuring compliance with all the coal mining legislation. III. Making and publishing Special Rules to be observed at his colliery e.g. Support Rules k for keeping the movement of the rock surrounding the roadways b, workings b etc. in the mine under control. In certain circumstances a mine owner was required to appoint an Under Manager for a coalmine but was allowed to have more than one. The appointee had to be the holder of either a Manager's or an Under Manager's Certificate and his appointment had to be made in writing. The owner or his agent had to send the Inspector of the District in which the mine was located written notice of the Under Manager's name and address. In the absence of the Manager, an Under Manager had the same legal responsibilities, and was subject to the same legal liabilities as the Manager. Reading and countersigning all reports relating to his district. Ensuring that those under him carried out their duties in a proper manner. Undertaking safety checks e.g.in respect to matters such as entry, exit, haulage, movement of explosives and ventilation 2. A ‘fore-overman’ was often taken to be superior to a ‘back-overman'. Miners who had spent some time as Shotfirers could apply to fill vacancies at this level on the management ladder. A Deputy was in charge of an area of the mine (e.g. a coalface, and its roadways) known as his district. At the start of their shift he and the men under him had a short get-together 2 at the Deputy's Kist b a short distance outbye b of the face before the men went to their places of work. His responsibilities included the supervision of the men working in his district, their safety, testing for gas and ensuring that the tasks allotted to his shift were completed. This was the first rung on the ladder of jobs above that of face worker. A Shotfirer was a suitably qualified miner with the requisite skill and knowledge to ensure shotfiring operations were carried out safely. A Higher National Certificate or a Higher National Diploma or a BSc in the subject of Mining Engineering. At least five years practical experience 2 of relevant work underground in a coalmine. An up-to-date first aid certificate that had to be kept up-to-date for the Manager’s/Under Manager’s certificate to remain valid. The exams tested an examinee’s knowledge of the provisions of the Mines and Quarries Act 1954 and Regulations made under them. A man with the relevant practical experience holding the appropriate educational qualifications could sit and pass the Manager’s Exam without ever sitting the Under Manager’s Exam. The storage, handling, movement and use of explosives, detonators b and associated equipment above and below ground were governed by stiff legal requirements 2. There were, for example, strict provisions governing the insertion of a detonator into a cartridge of explosive and where this was to be done. The vicinity of the shot b hole being examined for general safety. A test for the presence of methane b being carried out before a shot hole was charged, before firing and when it appeared necessary. Every shot hole being checked for breaks running along or across. The use only one detonator per shot hole, except in very exceptional circumstances. The insertion and ramming tight of a plug of stemming b in every shot hole before the explosive charge was inserted. The amount of permitted explosive used in a shot hole not being excessive. The explosive charge being positioned in a shot hole without the use of excessive force. The shot hole being stemmed with clay or sand after the explosive charge was in the correct position. The posting of sentries b to prevent unauthorized entry to the area the shotfirer had determined to be the danger zone. A Trainee Shotfirer under the close supervision of a Shotfirer m.